ray is part of the Basic English 850. (countable) A ray is a line of light or energy, coming out from where it starts. Some rays of light from the sun shone between the leaves of the tree and lighted the top of his head. (countable) A ray in math is a line that starts at one point and goes on forever in one direction. Two rays that start at the same point make an angle. 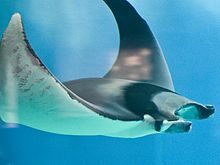 (countable) A ray is a type of fish which lives on the bottom of the ocean. This page was last edited on 11 November 2018, at 10:33.